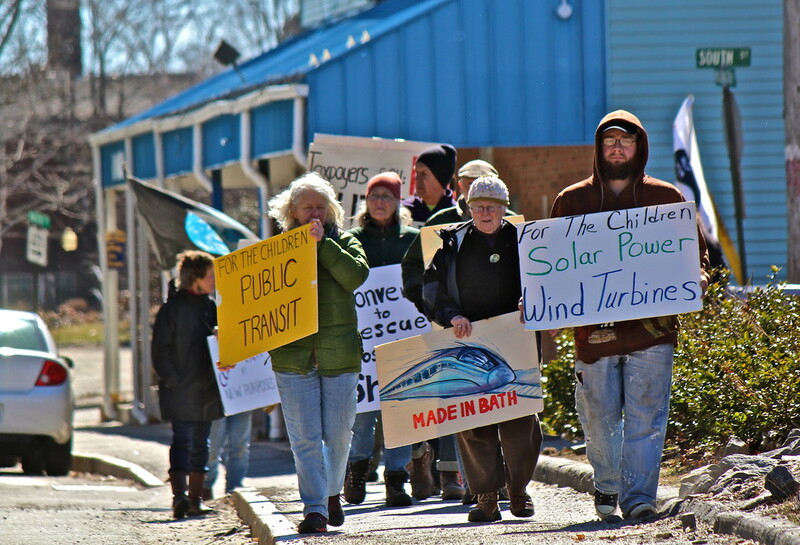 We had a great Maine Peace Walk finale event today in Bath. The weekly farmer's market was happening so during the three hours we were there with music and speakers many people stopped by for a listen. About 50 stuck around for the whole show. The weather was great and the spot at the Waterfront Park on the Kennebec River was a perfect location. I'll post more later as videos and photos come in. Bath Iron Works (BIW) from a nearby bridge. On lower left see the security boat watching us. Joyakgol from Jeju Island, South Korea joined us for the walk and has been a wonderful addition to our group. Once he leaves Maine he will speak in Boston, Waterbury & New Haven, Ct. and New York City. Standing at BIW during the 3:30 pm daily shift change. Workers are bused in every day from across Maine. 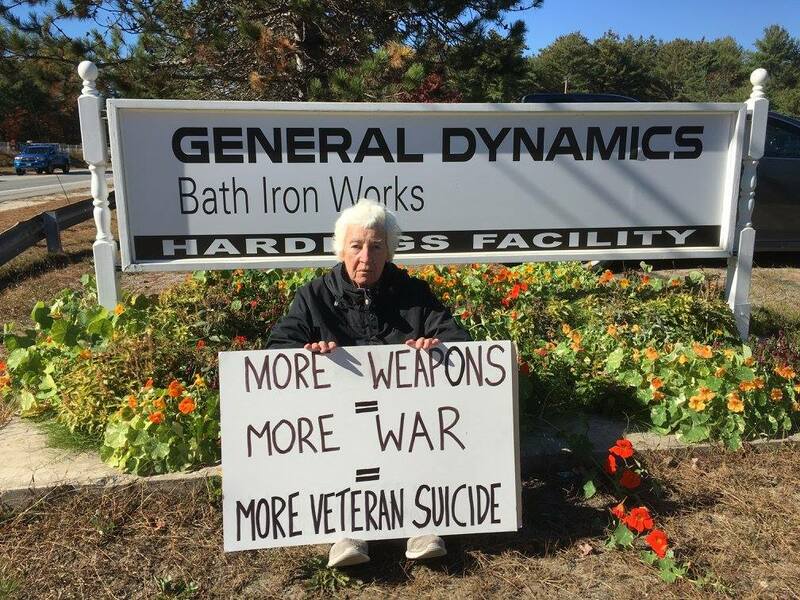 Out of the 5,500 workers at BIW only about 500 actually live in Bath. 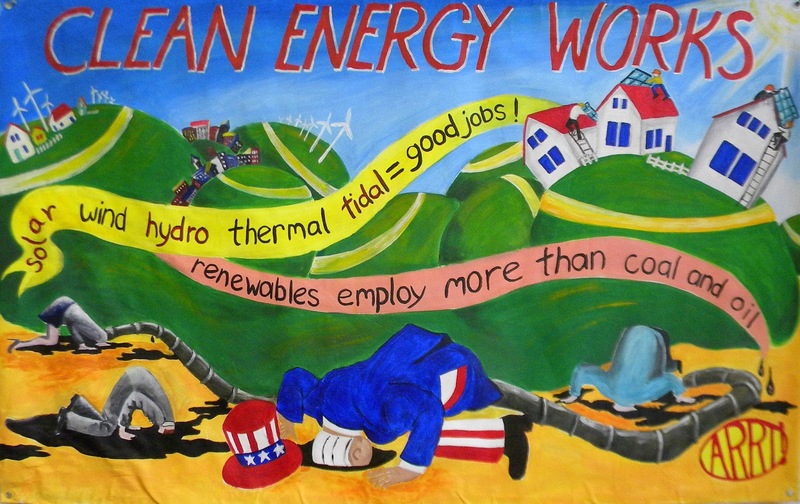 A new banner made for us by a local artists collective that makes banners for various protests in the state. Waiting for BIW workers to pour out of the shipyard. Our twice daily vigils at 6:00 am and 3:30 pm have helped to create a dialogue inside the shipyard and throughout the community. 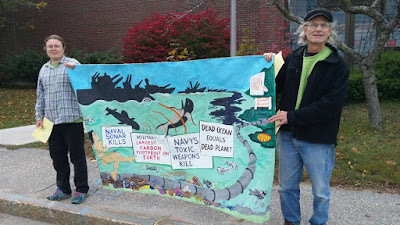 Another one of our great banners (click on it for a better view) being held by Morgana Warner Evans and Russell Wray. Walking the 10-miles to Brunswick on Tuesday this week. Crossing over the water on the way to Brunswick. Liz McAlister sits in front of the BIW facility on the old Bath Road. BIW has several facilities between Bath and Brunswick and we stopped at each one for a while on Tuesday. Our dear friend Ridgely Fuller from Belfast, Maine walked with us for two days and brought along two of her friends visiting from Washington state. Each day new people come and go which gives the walk a good new jolt of energy. 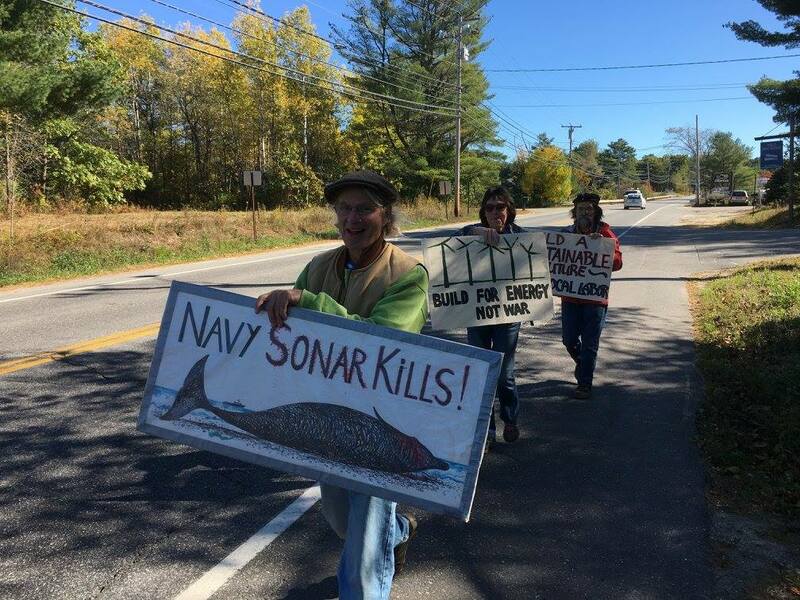 Artist Russell Wray carries his anti-sonar sign. 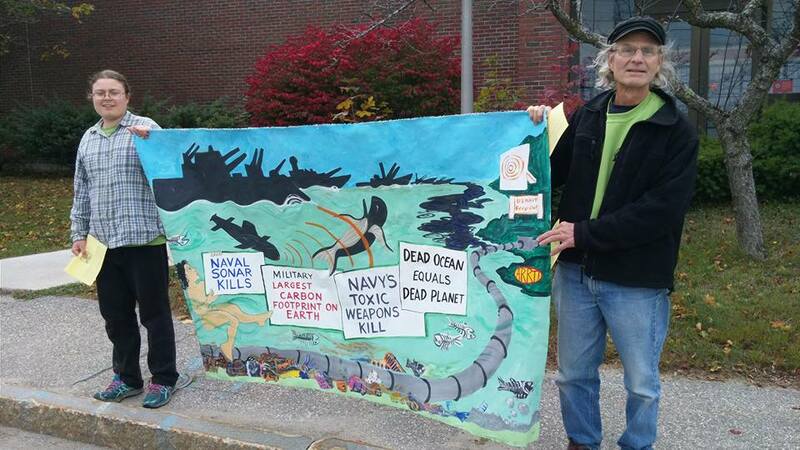 He has taught us all alot about the Navy impacts on sea life by sonar. Just today while at BIW one worker saw the sign and told me she had never before known that sea mammals are threatened by sonar. This well illustrates the power that just one sign can have on people. These photos are not in any particular order but are intended to give you a bit of a taste of what we have been doing this week. Today we walked around Bath as a group, in single file like a herd of elk. 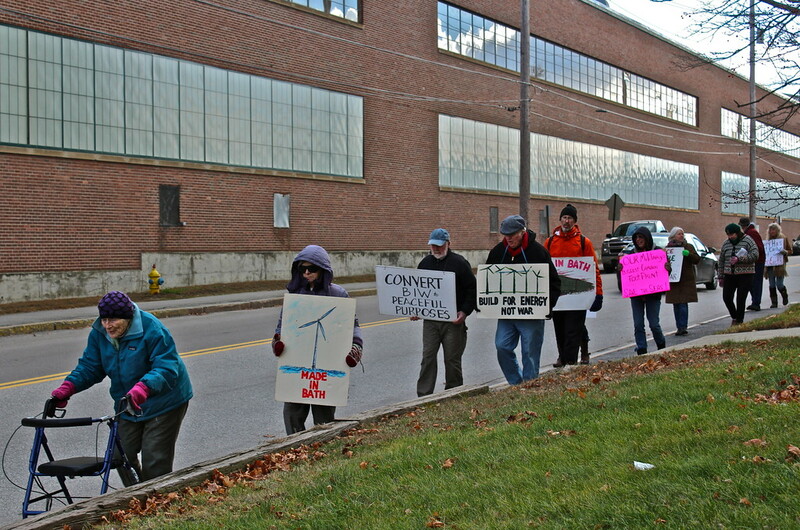 At 11:30 am we walked along Washington Street in front of BIW just as a couple hundred workers poured out of the facility for their lunch break. We were up close and personal and greeted many of them. Some responded and others did not want to make any eye contact. At 10:00 am we walked through some Bath neighborhoods and were quite pleased to see the response we got from people outside their homes and driving by. The majority of the people were friendly and very positive - took our flyers - one woman said, "I already got one here at my house" and then thanked us for doing the walk. We feel that people are clearly getting our message about the dire emergency to deal with climate change while we still can by converting BIW to build appropriate sustainable technologies. Tomorrow we will watch John Pilger's important new film called The Coming War with China and then walk around Bath some more. We will also do our 6:00 am and 3:30 pm BIW vigils as well and then have a pot luck supper and music in the evening at The Neighborhood church. We've got several excellent musicians in our group so it should be a good time for all. On Tuesday we walked from Bath to Brunswick. In front of the runway at the former Navy base in Brunswick we stopped and I told a story about being on the Jeju Island Grand March for Life and Peace two summers ago. (Ken Jones and Will Griffin, both here in Maine now, were there too.) Many hundreds of Koreans of all ages joined that walk around the island - one team going east and the other west and then they met up for a big finale event at the end. During each walking day the organizers stop the Jeju march and ask various organizations represented with their large flags on long poles to run along the line of peace marchers. The crowd cheers as they run back and forth in the intense South Korean summer heat. I asked Joyakgol from Jeju Island to show us how it is done. Then he was followed by John Morris (80 years old) from Maine who was carrying the Veterans For Peace flag. Join us for food, speakers, music. Everyone invited. Help us celebrate the conclusion of the 2017 Maine Peace Walk and give your support for the idea of ensuring that the future generations have a chance for life on Mother Earth by converting the military industrial complex to appropriate sustainable technology. 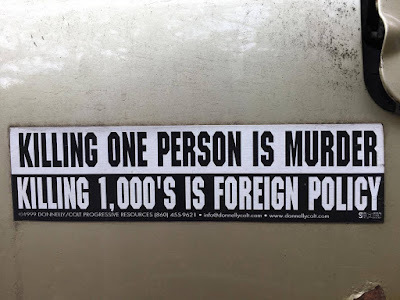 The real problem facing us today is global warming - not the need for endless war. Studies at UMASS-Amherst Economics Department have long shown that producing commuter rail systems, offshore wind turbines, solar and tidal power would in fact create more jobs at facilities like BIW than we currently get building warships. Spending on education, health care, and other social programs also creates more jobs than does military production. 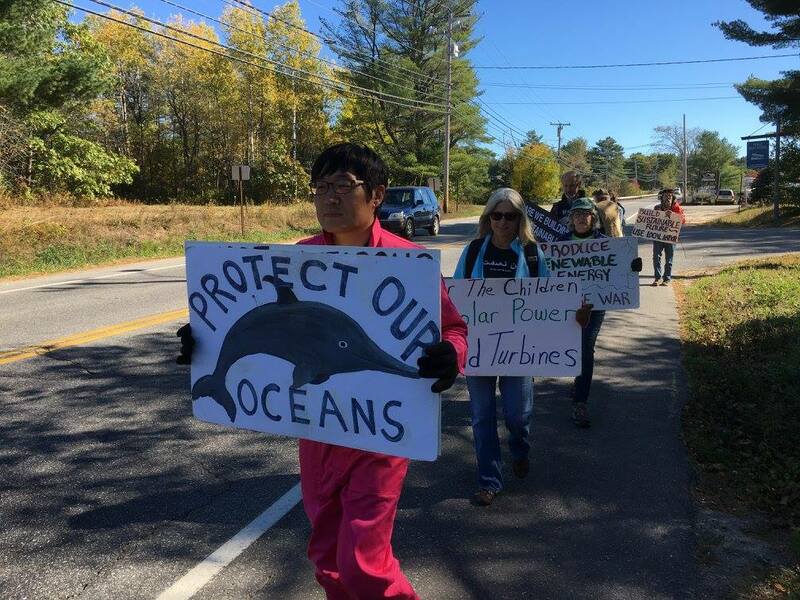 Come and share food, conversation and music with peace walkers from across Maine, the US, and South Korea. 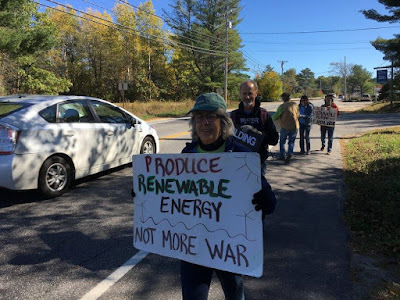 VFP member Will Griffin showed up in Maine for our Peace Walk with this video he made. Many thanks to him - he's a great activist and friend. 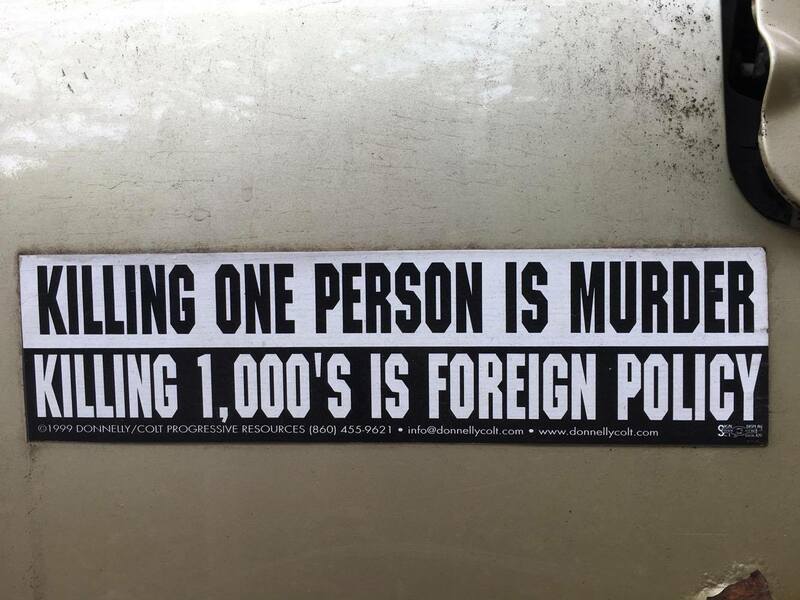 Be sure to follow his work at 'The Peace Report'. The latest edition of This Issue features Will Griffin (Veterans For Peace) who is an Iraq and Afghanistan war veteran and Joyakgol from South Korea - a long-time peace and environmental activist on Jeju Island and on the mainland. We discuss US policy in the Asia-Pacific region. 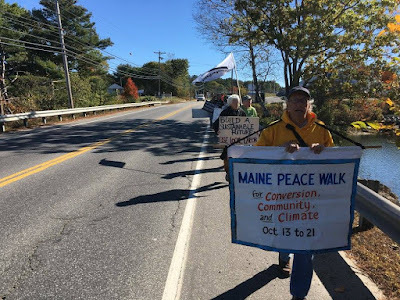 They are presently participating in the Maine Peace Walk. Busan, South Korea: People protest. How do the crews of US nuclear submarine Michigan dare to hold a party with long-dressed women while war crisis is being intensified? 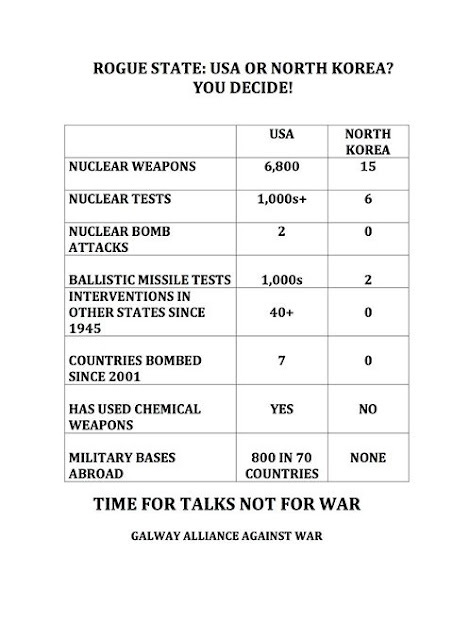 "Get out of Korea. 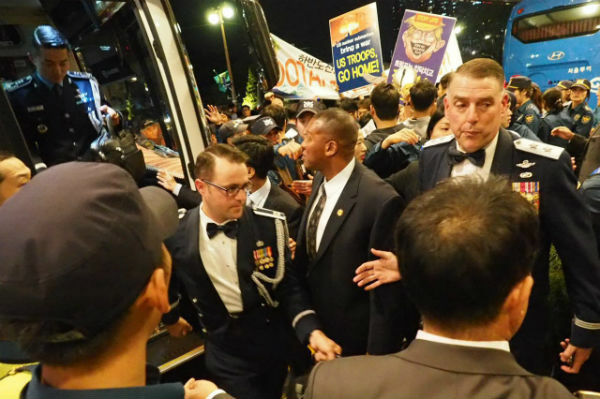 Go home," the woman shouts to the two highly-dressed American Navy personnel in the car. Economic conversion, defense conversion, or arms conversion, is a technical, economic and political process for moving from military to civilian production. The sixth Maine Peace Walk for Conversion, Community and Climate is concentrating on the serious need to convert Bath Iron Works (BIW) to peaceful and sustainable production. Yesterday we began doing our door-to-door flyer dropping across the city of Bath. We’ve divided the city into three parts – north, central and south and will do this over a three day period. We finished up the northern part of the city of 10,000 people on Saturday sooner than we had expected. We had six two-person teams that each had a pre-mapped section of the city to cover. This morning many of our folks went to a local church together and since we had an early rain we are waiting until after lunch to get out and start doing our door-to-door efforts again. Last evening a dozen of us went to a local restaurant for supper and shared stories from the day. 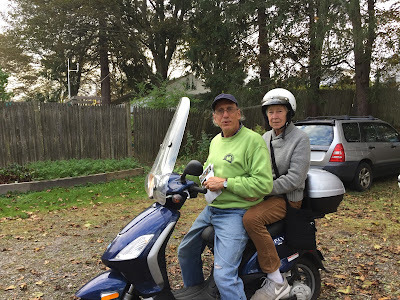 People were a bit surprised that the reactions they got from people as they flyered the neighborhoods were more positive than they had anticipated. 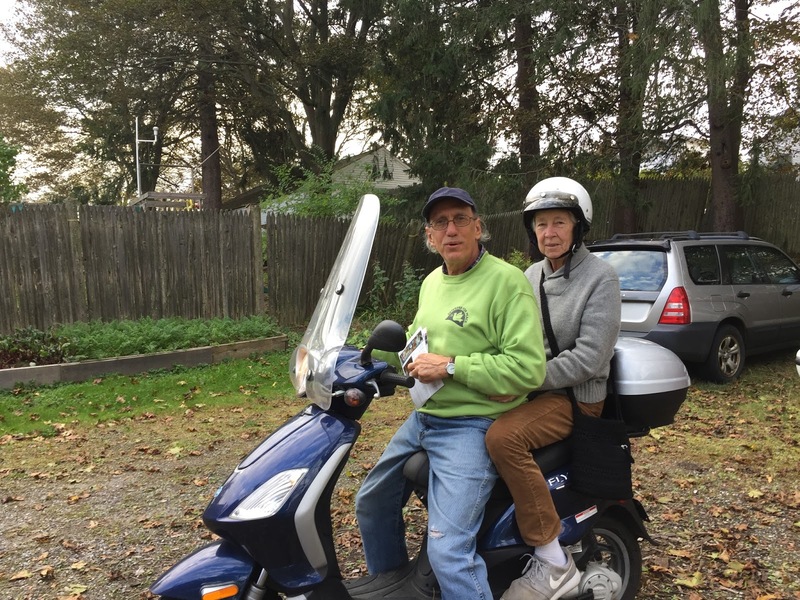 Local citizens appear to be getting it when we make the link between rapidly escalating climate change and the need to convert our fossil fuel dependent economy, and our #1 polluting military system, to alternative sustainable production. All one has to do is feel the weather here in Maine this week to notice the reality of global warming. It’s in the mid-to-high 60 degrees. In normal times in Maine it would be much colder with wool caps and gloves needed. Currently many people are still walking around with T-shirts on. The lobsters are heading north as the Gulf of Maine heats up. Now is the time to make this conversion transformation while it might still have some impact, even if it would be small, on the coming ravages of global warming. If we wait much longer our children and grandchildren face very rough times ahead.